Statistics kept by the Canadian Bankers Association show the number of mortgages in arrears (people that are behind on their payments more than 3 months) has grown significantly in Canada since the economic downturn in October of 2008. As a real estate investor we have the ability to help these people who have mortgage delinquencies and be able to make great money in the process. There are various financial situations people get themselves into and we need to have many ways to be able to “spin” each deal both for the benefit of the person in trouble and ourselves. The legal rights of the homeowner. Most homeowners do not understand their legal rights including their legal right of redemption. The time lines involved in each phase. The legal documents that are necessary in slowing down the process. The thing to realize in a Foreclosure or Power of Sale process, when a situation becomes dire, the mortgagee is looking to remove that owner from the property in order to get their borrowed funds back. The owner will be removed (sometimes forcefully) and in most cases may still owe money to the mortgagee. That said, the result of this process in a lot of cases has the borrower go from a homeowner to a homeless person. Yes, this happens in Canada! We make sure their mortgage, arrears and legal fees get paid off. We can give them first month and last month/security deposit in order to downsize. We can start them on a debit/credit card in order to begin rebuilding their credit. 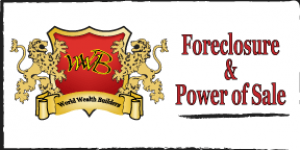 At Canadian Wealth Builders, we offer a 3 day intensive Foreclosure Apprenticeship training where you will learn how to help those people who have gotten in financial “hot water” and be able to make lots of money at the same time. You will learn everything encompassing the Power of Sale/ Foreclosure process including the law, the mortgage act(of your province) , the power of sale/foreclosure process in Canada, as well as all specifics relating to your province. The knowledge and skill you will acquire will surpass most lawyers and mortgage brokers in your province. This three-day training will include two days of in-class training and one day in the field where we go to the courthouse and where each student will get one or two fresh leads to follow through on.